Metropolitan Manila Development Authority’s (MMDA) officially announced thier new campaign to reinforce the anti-jaywalking policy. 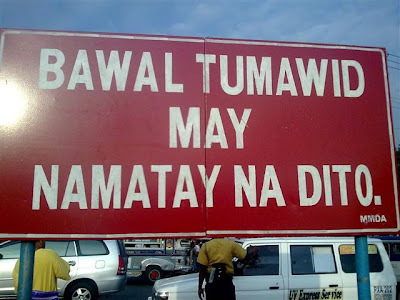 Starting today, June 5, 2012, Tuesday, every Jaywalkers will be fined with P200. MMDA chairman Francis Tolentino said to dzMM, "Sana po tuloy-tuloy. Bukas po sila magsisimula kaya minarapat naming ibang kulay ang pang-itaas nila para ma-distinguish po sila [kasi] hindi lahat ng tao namin ay allowed na manghuli dahil iba po ang ticket 'nun." But today, all jaywalkers will be given only a warnings. Previously, the violators were meted with a P150 fine. MMDA officials are now serious on ensuring the safety of pedestrians, they're more stricter against jaywalking. MMDA Tolentino said, "Ang mahalaga mai-highlight na seryoso rin tayo na mabawasan na ito (aksidente) at makita rin ang aming pagkukulang baka maituro sa amin na wala naman kayong pedestrian lane dyan." Meanwhile, MMDA staff had repainted some pedestrian lanes around Metro Manila. Comments or suggestions about "MMDA: Jaywalkers must pay P200 fine" is important to us, you may share it by using the comment box below.